Changing up your kitchen and bathrooms can be beneficial for you to enjoy as well as when it comes time to sell your home. As some of the most frequented rooms in your home, kitchens, and bathrooms need updates more often than other rooms. But if you are on a budget you may think that you can’t get the best remodel out there. Not to fear, there are many ways that you can make cost-effective decisions that will still provide you with an unbelievable remodel for either your kitchen or your bath, maybe even both. Even if you are on a really tight budget it is ideal to get a professional to create a beautiful layout for your kitchen or bathroom. By hiring a professional contractor you can rest assured that no surprises will crop up along the way. And if something happens, they are there with a solution. Hiring a professional ensures that you will know what works best in the space. These professionals will be able to inform you if your idea is something that could work or something that could lead to major problems down the line. And after the plans are all on paper you can be confident moving forward with your remodel knowing that you are getting exactly what you want within your specified budget. 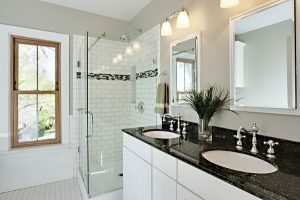 This is more often seen in bathrooms but can also be used in kitchen remodels. If you are dealing with a small area, you can simply use glass to add some depth to the room. For instance, you can add large windows in your bathroom to open the space up and make it feel larger than it actually is. In kitchens, homeowners can choose to use glass cabinets to make the room appear larger. Kitchen cabinets do not have to be the exact same style. You can easily add glass to only upper cabinets while keeping your lower cabinets covered. This design trick provides you with the illusion of a larger room while still maintaining some flexibility with keeping your existing cabinets they are. Whether you’re looking for a remodel or an update, talk to one of our experts at Elite Kitchens about building your dream timeless kitchen. With our excellent designers, installation process, and quality craftsmen, it’ll be the best investment you’ve made in your home. Contact us online, by calling 301-881-2776, or email us for a free estimate and assessment of your needs. All of our work is backed with a 100% satisfaction guarantee. We look forward to meeting your remodeling needs for years to come! To see examples of our work and get more tips, follow us on Facebook, Twitter, Google+, LinkedIn, Houzz, and Pinterest. This entry was posted on Thursday, February 23rd, 2017	at 12:38 pm	. You can follow any responses to this entry through the RSS 2.0	feed. Both comments and pings are currently closed.